Spain was one of the 'super powers' in Europe during the Age of Exploration. England, Spain, France, the Netherlands and Sweden were all looking to new lands, wealth and riches to build their empires and gain power. The European policies of Colonialism and Imperialism were designed to extend a nation's authority, power and influence by territorial gain and by the establishment of economic and political dominance. The discovery of the 'New World' provided new lands and opportunities for Spain and the Spanish in America, including their fervor to convert the indigenous population to the Christian and the Roman Catholic religion. Spain sent explorers of America who undertook the 3000 mile journey from Europe to North America across perilous, unchartered seas. These famous men reported their findings to Spain and many others followed them - the Spanish colonization of the new continent of America had begun - the Spanish called the lands New Spain. The Conquistadors were the Spanish Soldiers and Explorers referred to as 'el conquistador'. The Spanish word "conquistador" means conqueror. The attitude of the Spanish conquistadors to the Native American Indians was that they were savage and pagan. The initial quest for lands led to the decree by the Spanish government that the Encomienda system should be established in the New World. The primary purpose of the Encomienda feudal system was to indoctrinate the Native American Indians into the Catholic faith. 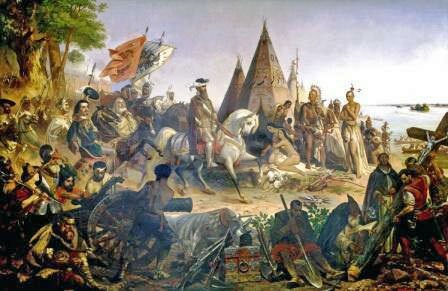 The Indians were expected to pay a tribute to the Spanish Conquistadors in return for protection and religious instruction. The Encomienda system was totally abused, the Spanish Conquistadors had unrestrained power in America and they abused, oppressed, exploited and ill-treated the Native Americans. The Spanish Conquistadors and Encomienda system came to signify the oppression and exploitation of the Native Indians who lost their freedom, their rights, their culture and their religion. The Spanish Conquistadors were feared and hated. The Encomienda system was replaced by new laws in 1542 but the Spanish were feared and hated by the indigenous population of America, a legacy that would continue to blight the Spanish in America. The European countries attempting to colonize America allowed their dynastic wars in Europe to spill over to America. The Swedish and the Dutch were been ousted from America, leaving the 'Super Powers' to fight for possession. The following map shows the land claims made by the Spanish, British and French and the disputed areas of the New World in 1754. The following Fact File contains fast information and facts about the Spanish in America. The Facts about the Spanish in America contains fast, interesting information about the attempts of Spain to colonize America which led to the inclusion of the Spanish in America. Spanish in America Fact 19 In 1763, Spain traded Florida to the Kingdom of Great Britain for control of Havana, Cuba, which had been captured by the British during the Seven Years' War.